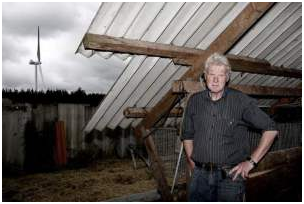 Photos: Danish wind farmer blames wind turbines (left) on 1,600 stillbirths and 320 miscarriages (right) among mother minks at his farm. June 18, 2014 (San Diego’s East County) – From Denmark to San Diego’s East County, concerns are growing over the safety of wind turbines near pregnant women, pets and livestock. Unlike the chemical or food industries, the wind industry has never had to provide safety data backed by any scientific studies on potential impacts of infrasound, noise or stray voltage from wind turbines on human reproductive health or even animals. But a growing number of deaths and deformities of baby animals near wind turbines, as well as high sterility rates in some adult animals, is heightening fears among people living near wind turbines about potential impacts on their own health—and the health of their children. ECM has previously reported on a study that found negative impacts from wind turbines on geese and other instances where health problems among livestock were observed near wind turbines including cattle deaths, high rates of stillbirths and miscarriages among horses, chickens laying eggs with no shells, and birth defects among goats, as ECM reported. Most alarming, now Kaj Bank Olesen, a mink farmer in Denmark, reports staggering reproductive problems after a wind turbine was erected 328 meters away. “Before the wind turbines came up, commonly there were only 5 to 10 minks that had abortions [miscarriages],” Greta Gallandy-Jakobsen, the mink farm’s veterinarian, told East County Magazine. Each year, 6,800 mink would get pregnant. 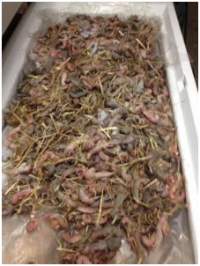 But after, 320 female minks had miscarriages and 1,600 stillborn baby minks were found to have been delivered. (The number is probably much higher, since the minks ate some stillborn pups.) 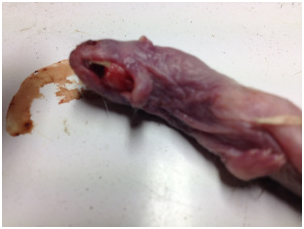 In addition, 963 minks were sterile and another 2,280 rejected male minks and failed to mate. Even among those that successfully gave birth, litter sizes dropped from 5 or 6 pups to just 3 or 4, a representative at the wind farm advised East County Magazine. There were also numerous birth defects. “The lack of eyeballs was the most common malformation,” said Mark Duchamp, chairman, World Council for Nature (WCN). Gallandy-Jakobsen, the veterinarian concluded that there were no other changes in habitat or food that could account for these devastating losses. If close proximity to wind farms and wind turbines can cause abortions and deaths to pregnant minks in a mink farm, then what could possibly happen to pregnant human females who lives within a similar distance to wind farms? One possible answer is the devastating effects of wind turbine syndrome (WTS) on the human and animal population. Some refer to WTS as the “nocebo effect,” however traction has been gaining in the past few months about the real health impacts and effects of wind turbines on humans and animals. For those wanting to conduct a literature review on direct experimental testing of wind farms and its effects on people, be prepared to be disappointed- there are no such studies. As egregious as this sounds, large scale wind companies are not required to test their products effects on humans before installation begins in a town. Where are the consumer safety alerts and precautions? Have wind companies sacrificed human health just to earn a higher profit margin? The 20 megawatt (MW) Shirley Wind Farm located in the town of Glenmore in Brown County, Wisconsin, has provided much anecdotal and medical evidence of wind farm harm. Dr. Jay Tibbets with the Brown County Board of Health and medical advisor to the Brown County Health Department, stated that the “effects on our citizens living in the immediate vicinity i.e. 2-3 mi. of the nearest turbine has been devastating. Ear pressure, pain, tinnitus, vertigo, headache, nausea, chest pain pressure, abdominal pain, poor concentration, sleep deprivation, irritability and depression are some of the symptoms our citizens are experiencing” windaction.org. The negative effects of stray infrasonic voltage and sounds have been known and recorded since the mid-1980s. The American Wind Energy Association (AWEA), created in 1974 would have you believe that there is no credible scientific evidence of the negative health effects associated with wind turbines to date. However, AWEA representatives have not offered any explanations as to what may be the cause for WTS, other than to dismiss its claims outright. Nor have they agreed to conduct any animal testing to determine safety. Oddly, “acoustic noise emissions testing” was the only health-related topic up for discussion on the government subsidies small wind turbine testing workshops. The federal government is supposed to serve and protect the people. With other industries, such as pharmaceutical and pesticide manufacturers, the government requires pre-market testing to assure products are safe, including extensive animal tests. Corporations are not allowed to simply throw products onto the market and there are penalties for covering up harm (nrel.gov). Yet thus far, the U.S. government has failed to police the safety of wind turbines with respect to reproductive health and many other concerns. Similar to the call for wind farm testing, the Food and Drug Administration (FDA) requires that all drug manufacturers complete testing on animals first, then “discover how the drug works and whether it's likely to be safe and work well in humans” before they are able to sell a new drug on the market place fda.gov . Then why not apply this logic to wind farms and require animal then human testing? For example, wind farm manufactures ought to first test an animal’s capacity to withstand stray voltage, infrasonic sounds and electromagnetic radiation. Then if stray voltage, infrasonic sounds, and electromagnetic radiation are determined to be safe at given minimum distance, then the human trials could begin. If the United States is either unable or unwilling to test the efficacy of citizen complaints regarding wind farm-generated health problems, then is any other nation taking the lead? In fact, the Australian Government National Health and Research Council has recently published findings from its 2009 through 2014 Systemic Review of the Evidence and literature review at nhmrc.gov.au. The purpose of the study was to investigate the anecdotal effects of “noise, shadow flicker and the electromagnetic radiation (EMR) produced by wind turbines” on human subjects. Although the 2010 NHMRC Public Statement concluded that “[t]here is currently no published scientific evidence to positively link wind turbines with adverse health effects,” it is worth pointing out that they have commissioned another review as of 2014. The next logical question for citizens would be: what negative health effects are related to low-frequency electromagnetic radiation? WHO has, however, made it public (albeit buried deep within the report) that ELF magnetic fields can cause a plethora of health problem, so why has the wind industry not been held accountable? So far, regulatory officials in Denmark have done nothing to help Olsen, the mink farmer from Denmark, whose minks remain under a veritable assault by the wind turbine that the farm’s veterinarian believes is responsible for the massive mink miscarriages, deaths and deformities. Most recently, Duchamp, reported on new claims by Olesen that this southwest wind generated by the wind farm, has now caused the mother minks to react aggressively by turning and attacking their young pups. These new aggressive reactions have caused 20 more pups to be euthanized along with 40 more pups to be placed under close supervision, the WCN reports (http://www.wcfn.org ). Why are parents, children, farmers, horses, sheeps, goats, minks, and other animals seemingly suffering the devastating negative health impacts of the wind industry, and where is the justice? When will wind farms be held accountable for this apparent poisoning of the land, animals and humans? Increasingly, those living near wind farms contend that it is clear that longer term epidemiological studies must be conducted on the health effects of wind farms. 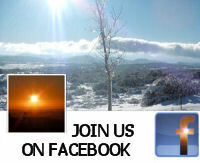 Until then, there ought to be a moratorium imposed on the construction of all new wind farms, concerned citizens believe. 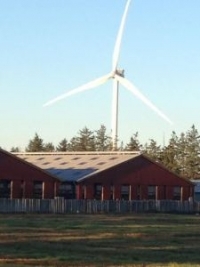 Moreover, until such time as scientific evidence can be produced through multiple double-blind studies demonstrating the safe minimum distance of wind farms, an immediate temporary closure of existing wind farms should also be implemented at least where evidence of harm has occurred—as with the mink farm in Denmark. Victims of wind energy conclude that the health of people and all of earth’s inhabitants should be more important than the profit margins of any corporation.